The location was great - really close to everything but in a lovely quiet terrace. The flat was well equipped and very comfortable. Great service and good information at all points. The hosts were great, particularly given they'd said we could check in early and then our flight was delayed! The location was within easy walk of Partick subway/train and shops and the flat was comfortable and well equipped, loved the tea/coffee and other bits left at check in. All in all a great stay, thank you! Devin was an excellent host and got a plumber extremely quickly for a minor problem. Quirky building, apartment felt very warm and safe. Das Apartment war sehr schick, großzügig und modern. Alles war von hoher Qualität und hatte einen tollen Blick. Es gab viel Platz, zwei Bäder, und die Lage war sehr gut. Ich würde dort sofort wieder absteigen. Sehr angenehm war der kostenlose Parkplatz. Unten im Haus war ein Tesco. Es gab viele gute Restaurants und einen großen Park in Fußnähe. Die Kommunikation und Übergabe war perfekt und sehr freundlich. Das WLAN war super schnell und stabil, hat man selten in solchen Wohnungen. Gaman að vera ekki alveg niður í miðbæ. Hugguleg íbúðagata. Ódýrt að taka leigubíl úr miðbænum og hægt að fara á fínan og kósí veitingastað í götunni með mjög almennilegu starfsfólki. Lock in a great price for West End Apartments – rated 9.3 by recent guests! West End Apartments This rating is a reflection of how the property compares to the industry standard when it comes to price, facilities and services available. It's based on a self-evaluation by the property. Use this rating to help choose your stay! 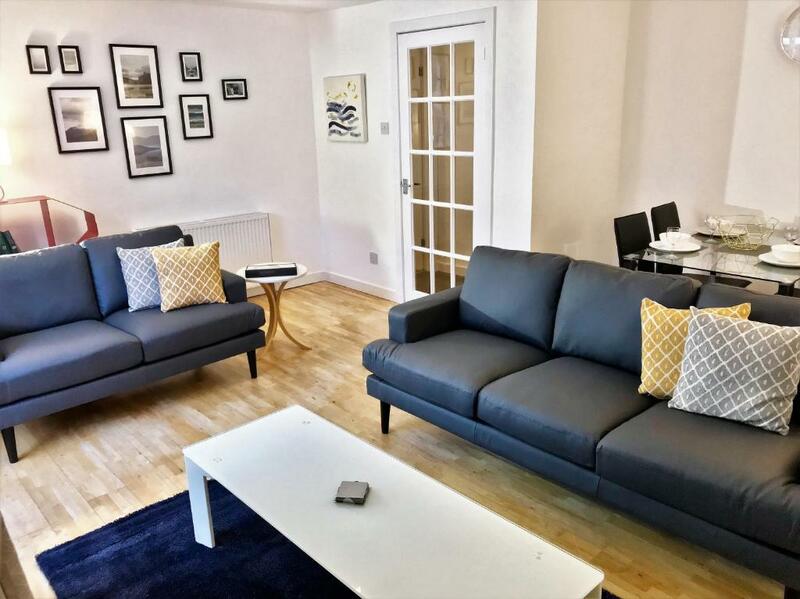 West End Apartments offers serviced apartments in various locations within the West End Area of Glasgow; all with free Wi-Fi, modern kitchens and living areas with a flat-screen TV. Apartments are set within elegant Victorian or modern buildings. With spacious open-plan living/dining areas each has a DVD player, comfortable seating and dining table; each bedroom has stylish décor; bathrooms have all modern facilities. Fully equipped kitchens include an oven/hob, washing machine with dryer and all necessary utensils. A welcome pack of tea, coffee and biscuits greets guests on arrival. Bars, shops and restaurants can be found within a 5 minute walk from the apartments in the vibrant West End area. Glasgow city center is just over 2 miles away and Edinburgh is an hour’s drive from the apartments. When would you like to stay at West End Apartments? A bathroom, a fully fitted kitchen, a living room, a dining area, free Wi-Fi, and a patio feature in this apartment located in the Kelvinbridge area, West End. A bathroom, a fully fitted kitchen, a living room and a dining area, free Wi-Fi, and views of the West End feature in this duplex apartment located in the Hyndland area. All 3 of the bedrooms benefits from an en suite bath or shower room. This is a second floor apartment with staircase access. Apartment address: 10 Rosslyn Terrace, Glasgow G12 9NA. A bathroom, a fully fitted kitchen, a living room with dining area and free Wi-Fi feature in this apartment located in the Hyndland area of the West End. Apartment Address 350 Meadowside Quay Walk, Glasgow, G11 6AW. This apartment has 2 double bedrooms, an en-suite and a balcony. It is located in the Glasgow Harbor area. Apartment Address 8 Devonshire Terrace, Glasgow, G12 0XF. This apartment is located in the basement of a Grade A-listed terrace. It contains a king-size bedroom, a lounge, kitchen and garden seating. The property can only be accessed by stairs to the basement. As a result, it may not be suitable for those with reduced mobility. West End Apartments, each located in separate buildings - all within 1.5 miles of Byres Road, the bustling centre of the West End. Glasgow’s West End is a large suburban area; please pay particular attention to the apartment address provided in the room description. Principal Apartments is a family-based team and we provide luxury flats for rent in Glasgow. Our team is based in the Merchant City. House Rules West End Apartments takes special requests – add in the next step! A GBP100 damage deposit is required on arrival (around USD130.49). This deposit will be fully refunded 7 days after check-out, as long as there isn't any damage to the property. West End Apartments accepts these cards and reserves the right to temporarily hold an amount prior to arrival. Please note that the map location of West End Apartments is based on the center of Byres Road. All apartments are within 1.5 miles of this central location. Check-in is at the address provided in the room description for each apartment. After a booking is made, guests will receive further check-in and key collection details. Please note that the property has no reception and arrivals have to be arranged in advance. Please note that these apartments are located in residential buildings and are not suitable for the purpose of having a party. A security deposit of GBP 100 is required prior to arrival for incidentals. This deposit is fully refundable upon check-out and subject to a damage inspection of the accommodations. Check-in is from 15:00 until 22:00. Guests may also check-in after 22:00 by appointment only. There is a late check-in fee of GBP 35 between 22:00 and 00:00. An arranged arrival between 00:00 and 02:00 is charged at GBP 50. Arrival between 00:00 and 02:00 without prior arrangement will be charged at GBP 100. Any type of extra bed or child's cot is upon request and will need to be confirmed by management. The total apartment occupancy includes adults and children. Please note that a cleaning service is carried out once a week for guests staying more than 7 nights and there will be no servicing for stays of 7 nights or less. Each guest is provided with 1 set of towels. A damage deposit of GBP 100 is required on arrival. That's about 130.49USD. This will be collected by credit card. You should be reimbursed within 7 days of check-out. Your deposit will be refunded in full by credit card, subject to an inspection of the property. Please note that the full amount of the reservation is due before arrival. Principal Apartments Ltd will send a confirmation with detailed payment information. After full payment is taken, the property's details, including the address and where to pick up the keys, will be sent to you by email. Please inform West End Apartments of your expected arrival time in advance. You can use the Special Requests box when booking, or contact the property directly using the contact details in your confirmation. Well, it is a basement apartment so this might be slightly unfair but there wasn't anywhere that had good enough lighting to put on make up. The lights either side of the bathroom mirror were too dull and given it is in a basement and the mirror is about half a mile from the window, they should have been super bright. Could also do with a shelf by the bathroom sink to put large quantities of face cream on. Look, at my age I need it!! This may not bother you and it would not stop me re-booking as three quarters of the hotels I stay in have useless lighting. Fabulous apartment. Met with keys by a charming member of the management company who helped with bag. They were very helpful when my train was running late and I was able to keep in contact with them by text so there was no issue with getting access. Great location for nipping into city centre on the bus or conecting with subway. Only ten min walk to railway as well if you need to go further afield. Flat was full of lovely old furniture but well kept. Innovative use of space in kitchen to provide seating area and table. Lovely little outside space which would be great in summer. The photographs of this place simply do not do it justice but I took some of my own to show people back at the office and it is quite hard to get a decent shot that really shows off the rooms as they are all quuite long and thin. The entrance hall to the building is truly amazing. I know you don't book an apartment for the entrance hall but this was fabulous. The apartment is almost on the Great Western Road but it's not actually on the main road. There is a line of trees between the entrance and the road so here is little noise even when the road is busy. Hop on the bus and in five minutes you are in the heart of the West End Byres Road with huge variety of eating and drinking places, Waitrose for your provisions and other small shops. You could probably walk it if you weren't pushed for time. This place seems pretty popular and unfortunately not available next time I am in Glasgow which is a real shame as I would defintely book again. Oh, and the piano was great. Even though I have one I never play it so it has re-kindled my enthusiasm. Not sure how enthusiastic the neighbours were but I didn't see a soul the whole time so I guess I didn't drive them mad. Can't really think of anything - if we were going to be really picky would have been good to have recycling instructions and perhaps a wooden spoon for cooking?!! 1 blind in master bedroom hardly worked. Nowhere in bathroom to hang towels Oven difficult to use because markings were worn away. There is one bathroom only.